Conveniently located 18 miles to the north of Dallas, Carrollton’s affordable neighborhoods and close proximity to acclaimed dining and shopping has prompted Money Magazine to call Carrollton one the best places to live in America. Summer temperatures can reach as high as 112 degrees Fahrenheit in Carrollton, so it’s no surprise that many homeowners enhance their properties with swimming pools and spas. If you are in need of Carrollton Fiberglass Pool Repair, call the experts at Texas Fiberglass Pools Inc.
At Texas Fiberglass Pools Inc. our commitment to excellence has put us in the forefront of the Carrollton fiberglass pool repair and swimming pool resurfacing business. By providing pool maintenance, pool repair, or fiberglass pool resurfacing services, we keep swimming pools, hot tubs, fountains, and baptisteries in Carrollton looking their best. From the city’s historic Carrollton Town Square with its charming gazebo to its well-tended outlying neighborhoods, the team of pool contractors at Texas Fiberglass Pools Inc. offers customized solutions for every pool resurfacing, repair, and maintenance need. From baptistery resurfacing to leak detection and crack repair, we’ve yet to encounter a project that we can’t handle. Timely maintenance will save you thousands of dollars in repairs and replacements. 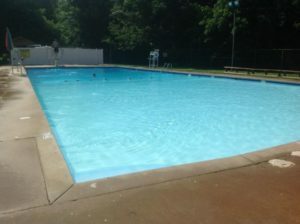 Carrollton pool owners who want the true experience of owning their own outdoor resort to extend past their pool will find that our Carrollton deck resurfacing services are as extravagant as they are affordable. We offer a large selection of materials for deck resurfacing, in a wide variety of colors and styles, for creating the one-of-a-kind look you desire. Our deck resurfacing professionals offer expert knowledge and advice on coatings, design, and materials that will provide the most pleasing and long-lasting results. At Texas Fiberglass Pools Inc. we offer services that improve your outdoor pool area too, including deck resurfacing, tile and coping replacement as well as water features like waterfalls and fountains. We’re equipped to turn your Carrollton backyard or garden into your own shady oasis. Contact us today for more information!